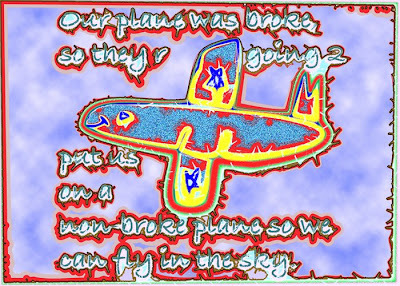 Diaristic Notations: Our plane was broke . . .
Our plane was broke . . .
can fly in the sky. I was so lost . . . It is never the right time . . . So I waited . . .
An angel came . . . When a dog is a pig . . .
Oh my gosh . . . He looks on . . .
MS. EVe AND ADAM eat UP. I don't know where I'm going . . . It is a shame that . . .